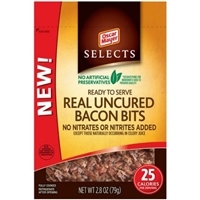 BACON (CURED WITH WATER, SALT, SUGAR, SODIUM NITRITE. 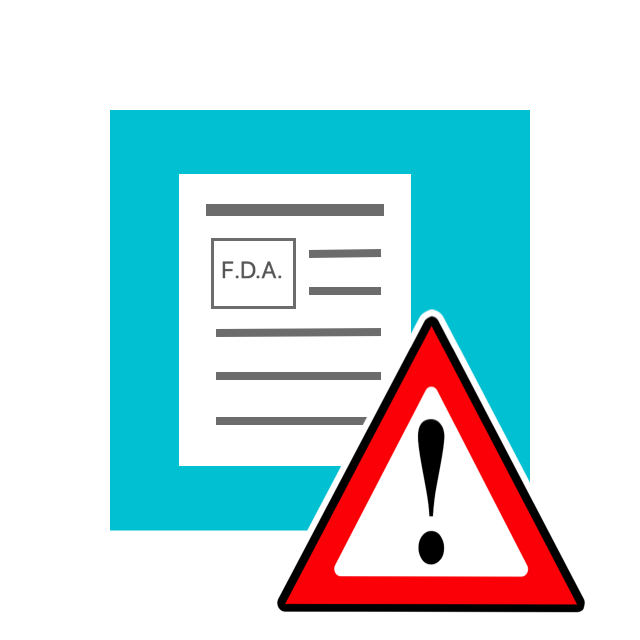 MAY ALSO CONTAIN SMOKE FLAVORING, DEXTROSE, BROWN SUGAR, SODIUM PHOSPHATE,, SODIUM ERYTHORBATE, SODIUM ASCORBATE, POTASSIUM CHLORIDE, FLAVORING). 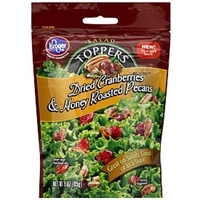 Dried cranberries (cranberries, sugar, glycerin, sunflower oil), honey roasted pecans (pecans, honey coating [sugar, wheat starch, honey, maltodextrin, xanthan gum], canola, sunflower, peanut and/or soybean oil, sugar, salt).contains: pecans, wheat. May contain peanuts and tree nuts. 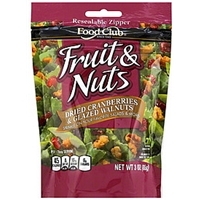 FRUIT & NUTS DRIED CRANBERRIES & GLAZED WALNUTS SPRINKLE ON YOUR FAVORITE SALADS & MORE! 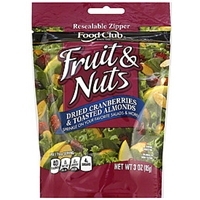 Dried cranberries (cranberries, sugar, glycerin, sunflower oil), glazed walnuts (walnuts, honey powder (sucrose wheat starch, honey), honey coating (sugar, honey, salt, corn starch, carrots [color], gum arabic, xanthan gum, propylene glycol, natural and artificial flavors (with caramel color), molasses powder [refinery syrup, molasses, raisin juice concentrate, citric acid, vegetable oil (may contain one or more of the following: peanut, canola, sunflower and/or soybean, maltodextrin, xanthan gum, sugar, salt.contains: walnuts, wheat. Packaged on shared equipment with peanuts, other tree nuts, milk, soy, egg. 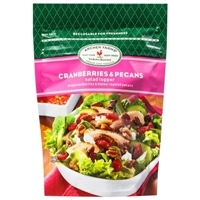 Dried cranberries (cranberries, sugar, glycerin, sunflower oil), almonds.contains: almonds. Packaged in a facility that also packages other tree nuts. Dried Cranberries (Cranberries, Sugar, Glycerin, Sunflower Oil), Honey-Roasted Pecans (Pecans, Honey Powder [Sugar, Wheat Starch, Honey], Vegetable Oil [May Contain One or More of the Following: Peanut, Canola, Sunflower and/or Soybean], Sugar, Maltodextrin, Xanthan Gum, Salt). 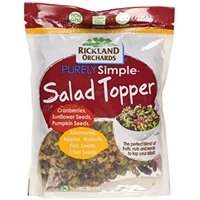 DRIED CRANBERRIES (CRANBERRIES, SUGAR, SUNFLOWER OIL), SHELLED PUMPKIN SEEDS, HULLED SUNFLOWER SEEDS, DRIED APPLES, WALNUTS, FLAX SEEDS, EDAMAME (SOYBEANS, SALT), CHIA SEEDS. Pork, water, salt, sugar, cultured celery juice (ingredients to preserve quality), sodium phosphates, cherry powder. 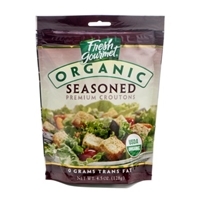 Gluten free.to help maintain freshness, we put a small packet of minerals inside to absorb extra oxygen. Do not eat. 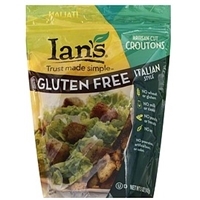 Brand/Manufacturer: Ian's Natural Foods Ian's Natural Foods, Inc.
Flour blend (brown rice flour, tapioca starch, potato starch, modified tapioca starch), rice milk (water, brown rice, safflower and/or sunflower and/or non-gmo canola oil, tricalcium phosphate, sea salt, vitamin a palmitate, vitamin d2, vitamin b12), water, non-gmo canola oil, egg whites, cane sugar, xanthan gum, salt, yeast, leavening (sodium acid pyrophosphate, baking soda, monocalcium phosphate), italian seasoning, garlic, pepper, ascorbic acid. Gluten free.contains: egg. 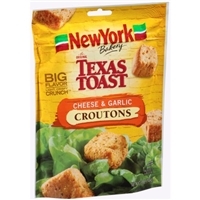 Wheat flour, canola and/or sunflower oil, romano cheese (park skim milk, cheese culture, salt, enzymes), dehydrated garlic, salt, water, yeast, parsley, natural butter flavor (a milk ingredient), malted barley flour, citric acid and/or tocopherols added to maintain freshness.contains: wheat, milk. 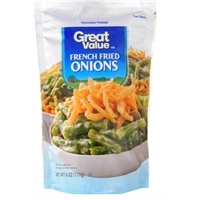 Onions, safflower and/or sunflower oil, enriched flour (wheat flour, niacin, reduced iron, thiamin mononitrate, riboflavin, folic acid), salt. Allergy warning: contains wheat. 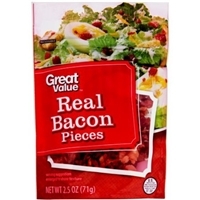 May contain traces of milk, anchovies, almonds, pecans, walnuts and soy. Ingredientes: cebolla, aceite de cartamo y/o girasol, harina enriquecida (harina de trigo, niacina, hierro reducido, mononitrato de tiamina, riboflavina, acido folico), sal. Advertencia por alergia: contiene trigo. 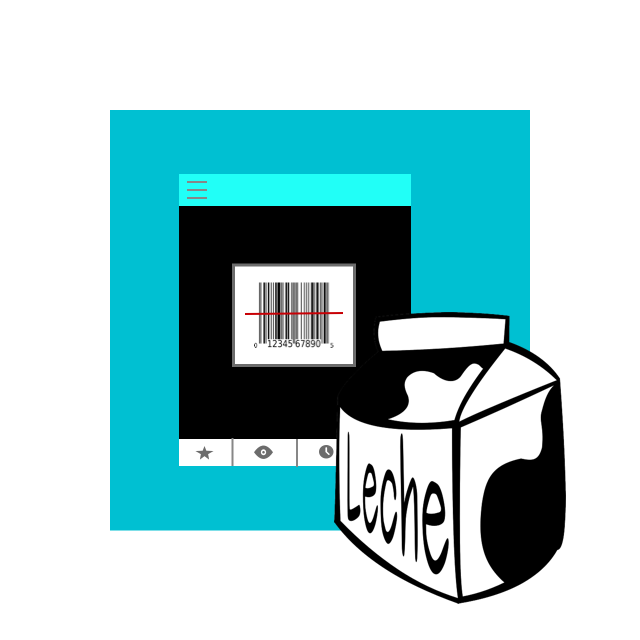 Puede contener trazas de leche, anchoas, almendras, pacanas, nueces de castilla y soya. 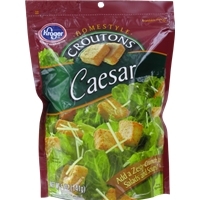 CRISPY AND CRUNCHY, FRESH GOURMET CHEESE & GARLIC PREMIUM CROUTONS ADD TASTE AND EXCITEMENT TO SALADS AND MORE. Enriched flour (wheat flour, malted barley flour, niacin, reduced iron, thiamin mononitrate, riboflavin, folic acid), canola and/or sunflower oil, high fructose corn syrup, 2% or less of yeast, salt, wheat gluten, corn syrup solids, whey, romano cheese solids from cow's milk, parmesan, cheddar and blue cheeses (pasteurized milk, cheese cultures, salt, enzymes), maltodextrin, calcium propionate (preservative), calcium peroxide, calcium sulfate, ascorbic acid, azodicarbonamide, sodium stearoyl, lactylate, autolyzed yeast, garlic powder, parsley (dehydrated), cultured whey, autolyzed yeast extract, food starch modified, vinegar solids, cream, nonfat milk, natural flavor, citric acid, annatto and turmeric (color), tbhq (to preserve freshness).contains: wheat and milk. Packaged in a facility that also packages tree nuts. 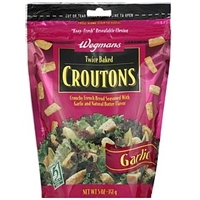 Brand/Manufacturer: Wegmans Croutons Wegmans Food Markets, Inc. Wheat flour, canola and/or sunflower oil, dehydrated garlic, salt, yeast, water, natural butter flavor, malted barley flour, citric acid and/or tocopherols added to maintain freshness.contains wheat and milk. Enriched wheat flour (wheat flour, niacin, reduced iron, thiamin mononitrate, riboflavin, folic acid). 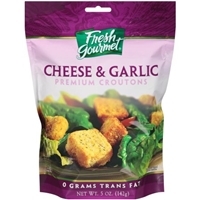 Canola and/or olive oil, salt, sugar, yeast, dehydrated onion, dehydrated garlic, spices, natural flavor (contains milk), dextrose.contains: wheat, milk. 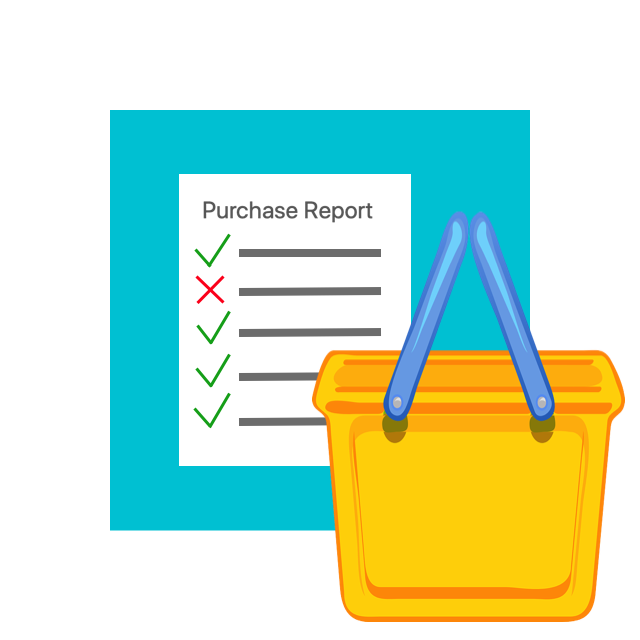 Bht added to package to maintain freshness. Organic wheat flour, organic sunflower and/or organic safflower oil, organic cracked rye, organic cracked wheat, yeast, 2% or less of salt, organic sugar, organic wheat gluten, organic garlic powder, organic dehydrated parsley, organic onion powder.contains: wheat. Packaged in a facility that also packages tree nuts.